Here are some jars that I bought from IKEA and turned them into gifts for some friends. You can fill the jars with anything you like. 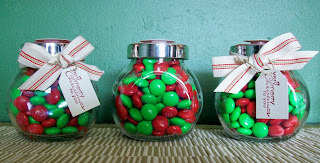 I chose red & green M&M's. Accessories: Tag Punch, Hemp Twine, Ribbon and IKEA jars. All products from Stampin Up! and jars from IKEA.